However, Bitcoin wasn’t the first cryptocurrency known to the world, and neither was Blockchain. Before Bitcoin, many cryptocurrencies and supporting technologies emerged and submerged subsequently. Amid the cluttered environment, what made Blockchain an accessible and intriguing choice was its ability to provide a decentralised platform to facilitate critical Bitcoin transactions. The tamper-proof technology with this much extent of immunity to maintain ledgers with massive data was unbeatable, and this is a base of several experiments today, all targeted towards exploiting its benefits for different spectrums. As the Bitcoin gained popularity, experts categorised the first version of the technology as – Blockchain 1.0. The technology progressed, and Ethereum surfaced and supported the execution of various applications as programmed, the technology got the new name as Blockchain 2.0. Now, a more original version of the technology is about to release, and there is a constant debate amid the experts about its name as Blockchain 3.0 Direct Acyclic Graph or DAG. 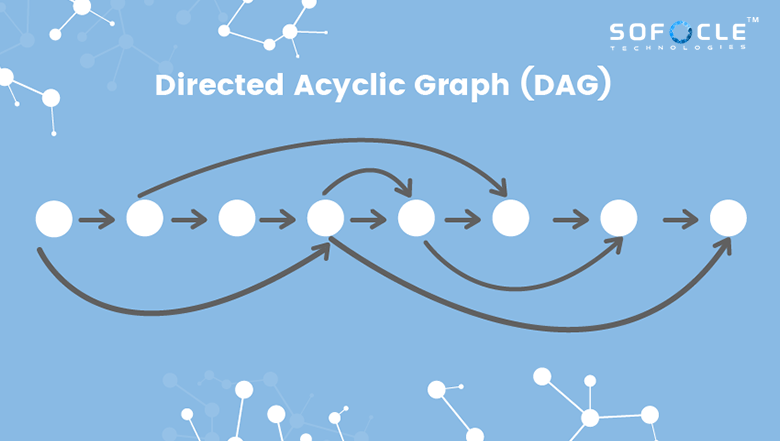 DAG is a directed graph data structure that functions using topological ordering. The technology operated in a fixed pattern wherein the sequence can only go from earlier to later. DAG is an acutely important application for data processing, scheduling, finding the best route in navigation, and data compression. Being the third generation of the blockchain technology, DAG inevitably comes jam-packed with more and enhanced features. Bitcoin is more regulated with proof-of-work (POW) system; it restricts the regular creation of blocks. It stores the data of all transaction occurring at the same time in one block only. And one single block is created in every 10 minutes and miners have to complete the block validation process to proceed further. These limitations needed a plausible solution, a community came up with the refined idea of altering the chain-like storage structure a DAG structure of blocks. It supports the extension of the storage by X times with X blocks on the network at any time. The only condition is that the time of mining must remain unchanged. The blockchain identifies itself as a cryptographically verifiable list. It is a data structure wherein every entry made to a particular block holds a reference to a previous entry. With such leverage, the blockchains gain the potential of traceability, and a user can easily trace any block written and recorded in the ledger. However, it is the reason that scalability issues lie with bitcoin, and it takes 10 minutes to append new blocks in the chain. On the other hand, Directed Acyclic Graph is a data structure that operates on the implementation of graphs. The technology offers the networks an ability to combat the limitations of the blockchain. Unlike blockchain, there is no loop system in DAG or Directed Acyclic Graph. All the nodes in the chain directed towards the same facilitate management. DAGs structure can be compared with a file directory structure wherein there are folders connected with sub-folders which have further branches connecting with sub-folders and so on. DAG also compares bitcoin with a common ancestry tree. When analysed in-depth, it does not appear as a tree theoretically but is a directed acyclic graph as to follow a tree-like structure in which every two nodes must connect through different paths. While Ethereum or Bitcoin was limited, DAG powered networks have great potential and allows appending parallel nodes till the time things flow in a single direction. Bitcoin’s theory is based on UTXO (Unspent Transaction Output) model. Here users are allowed to place a single transaction placed under their UTXO. One or more miners now can perform the hash function and seek the authority of validating the block. The validation value here depends upon the number of transactions following a single transaction. What makes the trade safer is that once a business has more sales following it, it has lower chances to return to the network. After validation, a transaction must be lined parallelly to an existing and relatively new transaction on the DAG network. In case, every time, the sales are linked with an earlier transaction, it will result in a way too broad network where validating the new transaction would become complicated. For this reason, the DAG network links a new transaction to an existing one. It is targeted to regulate the width of the system and ensure that the network is limited with a rapid rate of validation. There are no blocks in the network, and thus the transactions directly enter the DAG networks. It makes the DAG system faster than other Blockchain systems that operate on PoW and PoS platform. Unlike Bitcoin, DAG network has no miners. Automated validation makes transactions safe and secure, resulting in faster processing and the user can reap the transactions instantly. The vision behind fostering DAG technology is to make a future network smooth & functional with minimum transaction fee levied. In this way, the users willing to transact smaller amounts can quickly send them without paying hefty prices, unlike Bitcoin & Ethereum. IOTA is the most widely known cryptocurrency nowadays. With its unique features and claims of removing the transaction fee as well as the miners, the currency has left many industries enthralled. Bitcoin is complicated. Miners have to compete and solve a mathematical puzzle and win the opportunity to contribute to the blockchain’s history. People with higher hashing power do have a competitive edge than people who do not. So, the group of people (miners) that get the benefit out of the blockchain is relatively smaller. On the Contrary, in IOTA, everyone enjoys the benefits and may act as a miner. It directly implies that if you wish to mine and submit a transaction to IOTA, you need first to validate at least 2 previous transactions. With this effort, the IOTA creates restriction free zone as unlike Bitcoin; there aren’t robust pools that regulate the industry. Moreover, there is no transaction fee involved. It offers excellent scalability, and each new member adds value to the chain by just joining in. In this way, the system bolsters quick work for the best results in comparison to Bitcoin. 1-IOTA functions on its cryptographic algorithm. According to the industry experts is a big alarm sign. 2-As per a report issued by MIT in 2017, there are many significant concerns in the IOTA System. However, the issues have been dealt with. But for any other project like IOTA that uses their crypto algorithms, such problems arise time to time. 3-It is susceptible to market risk, and attackers can easily break in without any trouble. In Bitcoin, a miner has to collect over 50% of the network’s hash rate and thus can invalidate any legitimate transaction. But for IOTA, anyone having only 33% of the hashing power is enough. These security risk might fade away as more members join in. As of now, IOTA has started using a centralised server known as Coordinator (Coo) for resolving such problems. Also Read: How to build an Effective Blockchain Solution? There is another project that operates on DAG and is likely to become the market leader- IoT Chain (ITC). The system is capable of handling more than 10,000 transactions per second. Backed by leading blockchain funds, the technology is likely to boom shortly. It shows all the signs to be categorised as Blockchain 3.0. DAG is for sure a marvellous human made invention and will be best used in areas where businesses require scalability and thus involve in thousands of transactions per second. When comparing DAG with Ethereum, there are different sets of pros & cons. The smart contracts offered by Ethereum are way more efficient and straightforward than DAG. Indeed, DAG offers intelligent, and they are more user-friendly and direct than the one provided by Ethereum. This way users get a bright idea as to how their currency will be used, and they will be paid in the future. If, DAG becomes the future, it offers all the signs to be more advantageous than Blockchain at the current level. With users facing problem in blockchain system every other day, it is very much expected that there will be a massive transfer of users. Ethereum was clogged because of its slow processing and high feed. Though Ethereum has a solution for the same, it is at least five years out. To scale, applications will shift to DAG very soon, and the future will be brighter, indeed! Next PostNext How Can Blockchain Put An End To Fraud In Financial Transaction?